Both of the new features really boil down to embedding files within a plain text document. You can now reference other files within iA Writer, so that they show up as part of your document when you head to preview mode. iA envisions this as a great way to add CSV spreadsheets, images, and even other text files right in your current document. On the Mac this is just a matter of dragging and dropping a file into the Library view, and then referencing that filename in the text. It took a little while for me to figure out how to achieve the same thing on my iPhone. The caveat is that that this new feature works with iCloud Photo Library, which is what iA Writer uses by default. You can still sync and use Dropbox files in iA Writer 4, but they won’t support embedding. The other thing to know is that your embedded files have to be in the same subfolder as your current document. I keep separate folders for each of the websites I write for, so embedding these images means that these folders will be populated with the .txt articles and the .png and .jpg images over time. 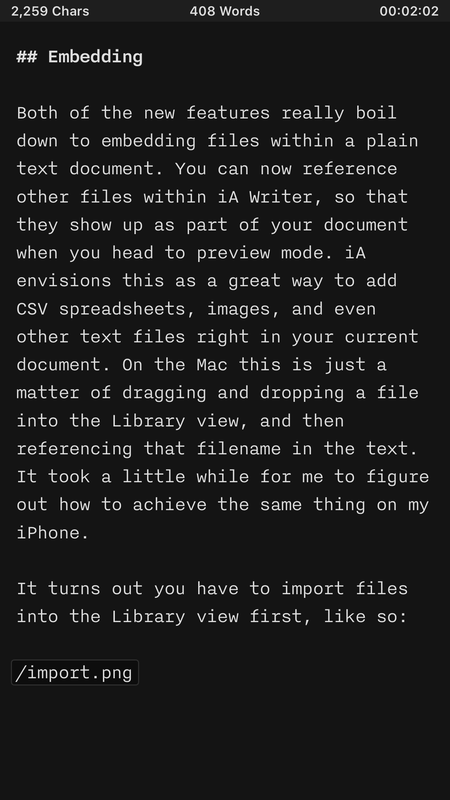 iA seems to have designed with this in mind, as iA Writer’s library window prioritizes text files over everything else â€” in other words, the images and attachments will always appear at the bottom of the library. Time will tell how elegant a solution this is, but I do like that iA Writer exposes the files for easy access. Ulysses, my other favourite writing app, also features in-line image support, but it embeds all of the images in the actual Ulysses file. 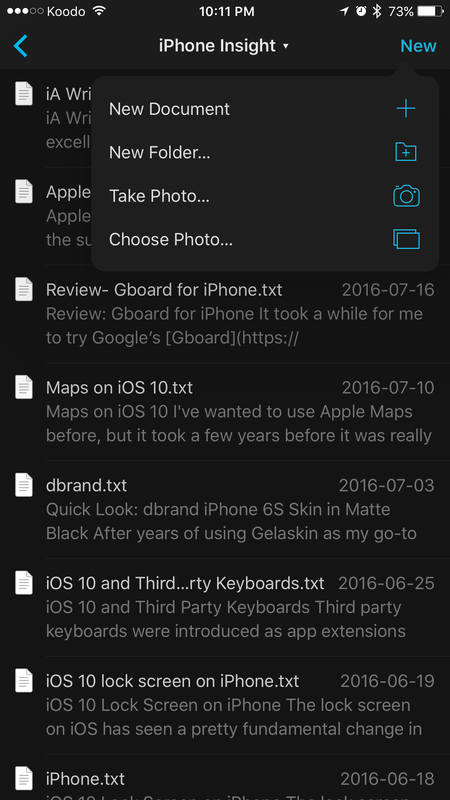 This keeps the file as a single unit, but also obscures them from the iCloud Drive app, so you have to use Ulysses to manage your text files, and nothing else. iA Writer’s approach can look a bit messier, but it’s also more transparent. I’ve been bouncing between iA Writer and Ulysses for years, and it’s great to have such a tight competition for writing apps on iOS and macOS. Both of these apps feature night mode, some sort of typewriter mode to keep text centered, and they can both publish to WordPress. However, Ulysses has better support self-hosted WordPress sites. All of the sites I write for are self-hosted, and the ability to embed images and upload them is a huge time-saver. iA Writer is only able to publish to a self-hosted site if you have Jetpack activated, and we don’t have it on iPhone Insight at this time.Â However, at $34.99, Ulysses is a tool you’ll buy if youÂ know you’ll be doing a lot of writing. iA Writer is also a great writer’s tool, but it’s currently a lot cheaper at just $5.50 on the Canadian App Store. Â iA Writer’s font, Nitti Light still feels really good to use: incredibly legible and fun to write with. I also think thatÂ Writer has the advantage in how its focus mode feels: it’s simply more responsive than Ulysses’ take on the feature. So while Ulysses may be ahead in terms of the features that save me time, Writer still has more soul in terms how it feels to operate. I may not be able to take full advantage of this major update due to my current web setup, but if you have a self-hosted WordPress blog with Jetpack, then you’ll definitely want to give iA Writer 4 a try. With the incredible plain text embedding features, this app could easily become your new blogging tool.